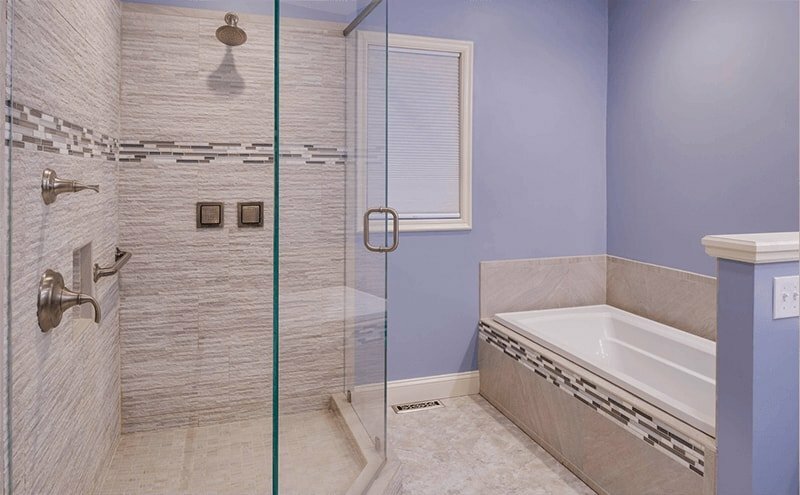 Our client wanted a bright and open master bathroom with a modern feel to accommodate two people during the morning rush to replace their dated bathroom. 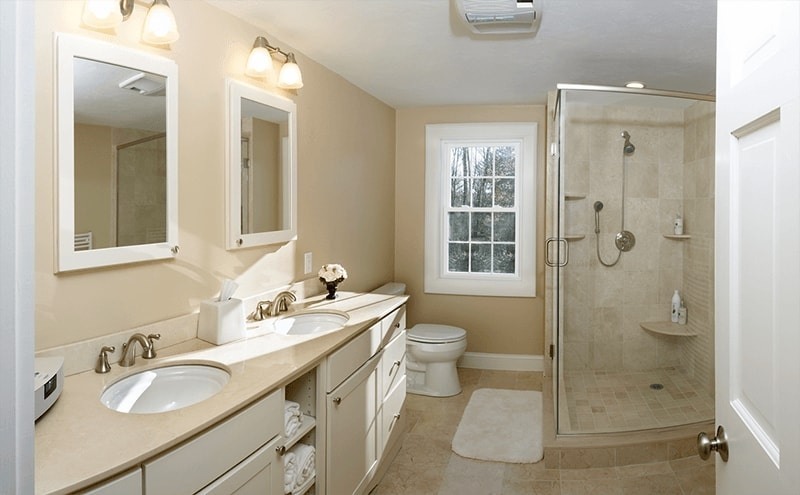 Our clients were very unhappy with their current bath. 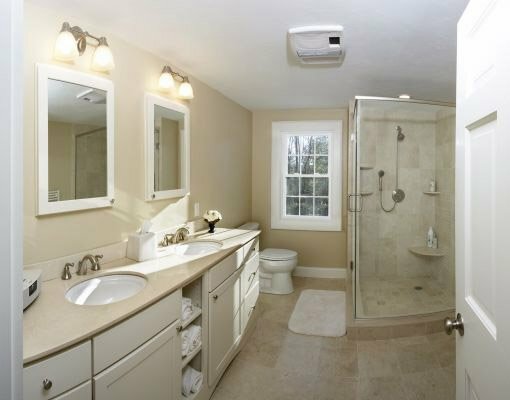 Their biggest concern was that their present bathroom was dated and didn’t reflect their sophisticated sense of style. 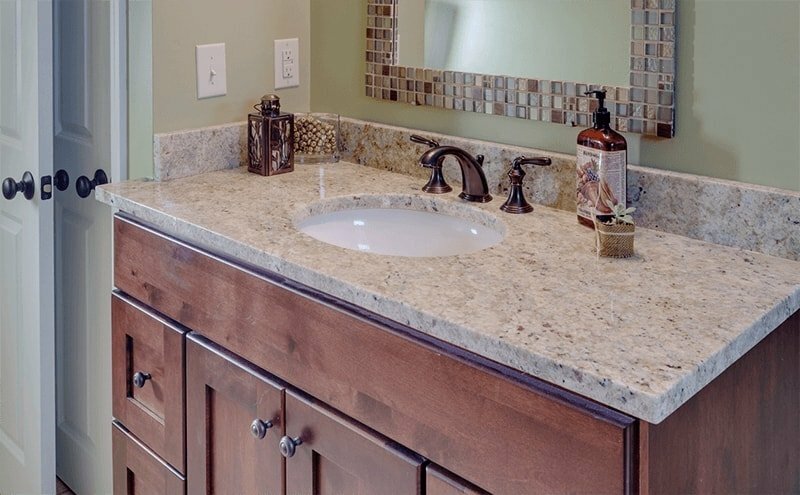 Additionally, the floor was worn and difficult to keep clean; the countertops did not provide sufficient for space for two, and there was not enough storage space. 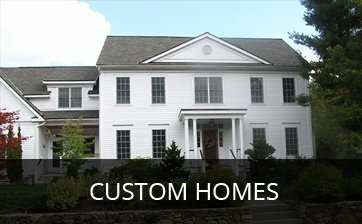 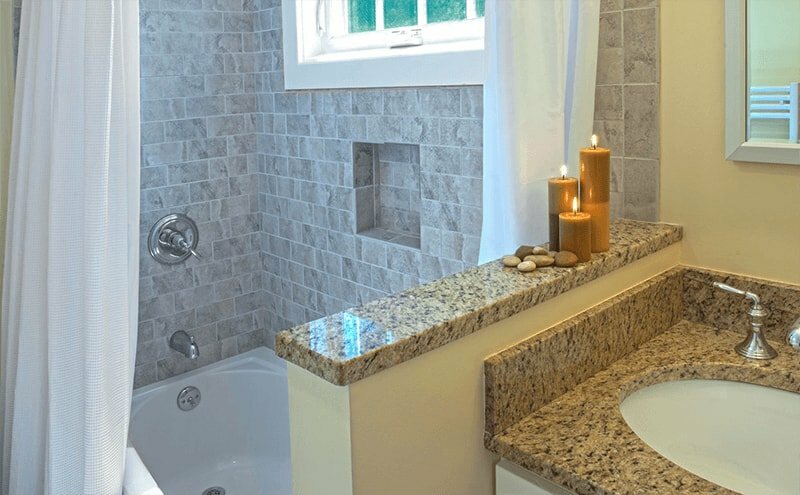 After meeting with our clients and discussing their needs and concerns and most importantly, what they really wanted from their new bathroom, our design consultant presented them with a number of options and our clients selected a bathroom design that achieved both their aesthetic and functional goals. 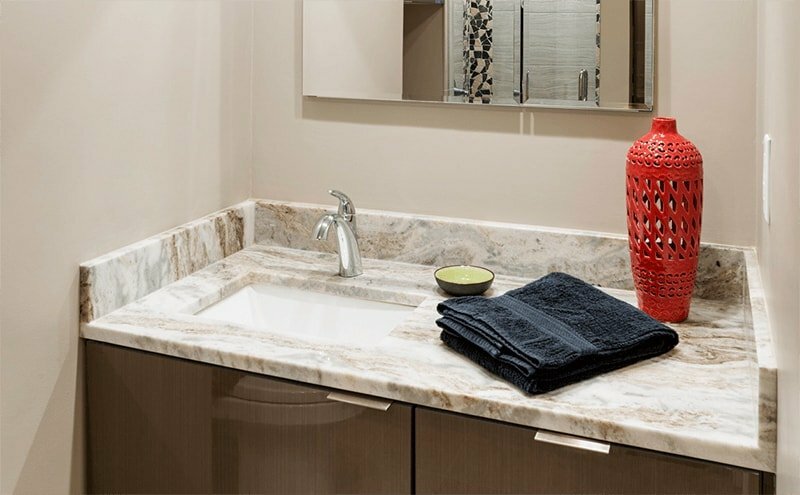 Because we were moving walls to reconfigure the space to accommodate a larger closet and second floor laundry area, it made sense to reconfigure the layout of the room. 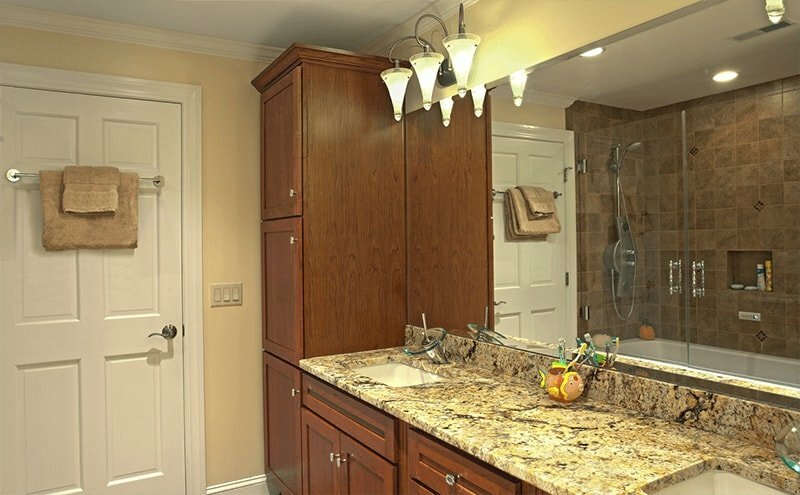 To dramatically increase storage space, we added a closet, a larger vanity and recessed medicine cabinets. In keeping with our clients’ tastes, we pursued a neutral color palette to achieve a sophisticated feel. The large vanity is custom maple cabinetry in a transitional style painted an Antique Soft Cream with an Oatmeal glaze. 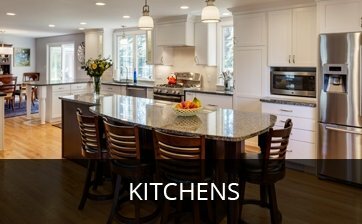 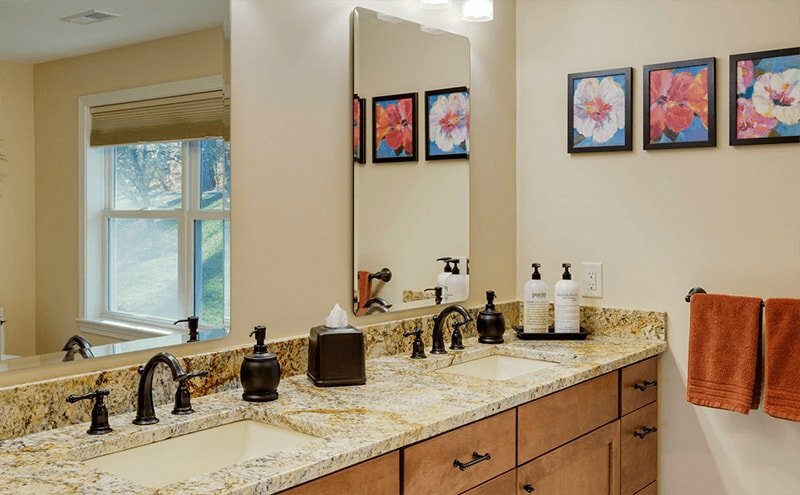 We used Carrera Marble countertops and Kohler undermount sinks, with Kohler widespread faucets with traditional lever handles in brushed nickel. 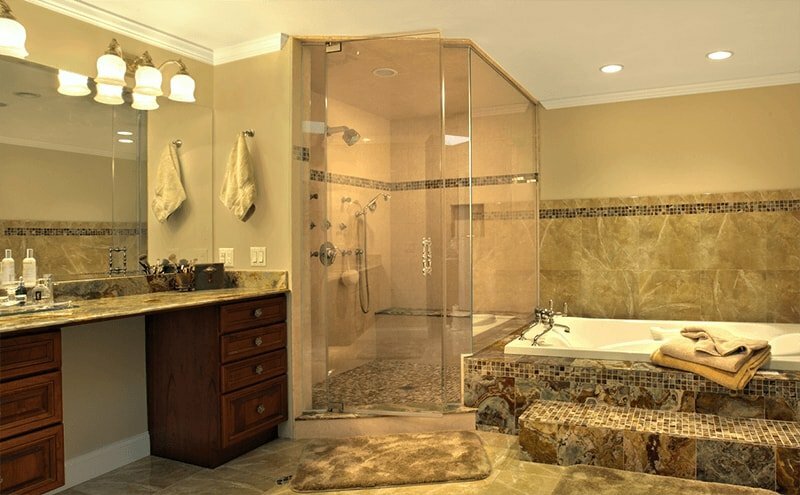 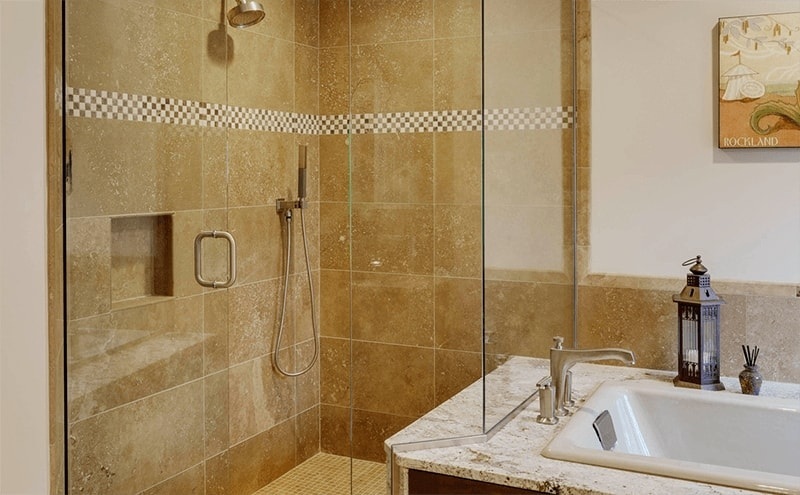 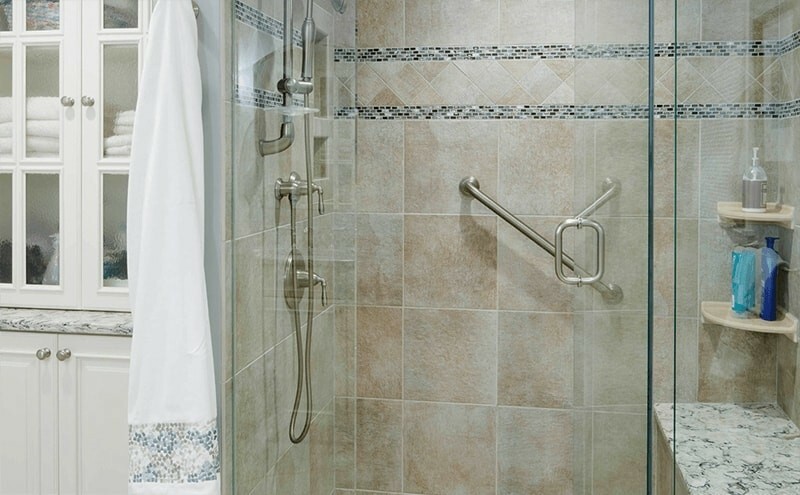 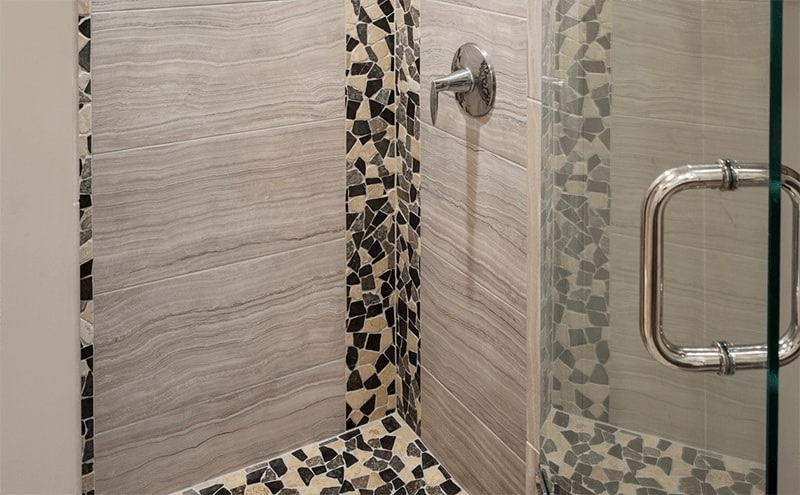 The frameless shower area also contributes to the open feel of the room. 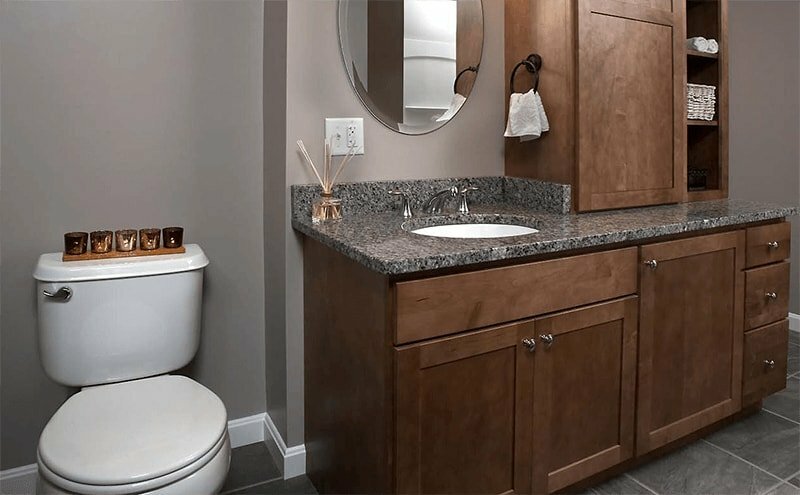 The bathroom also features a Kohler comfort-height elongated toilet and coordinating brushed nickel fixtures and accessories. 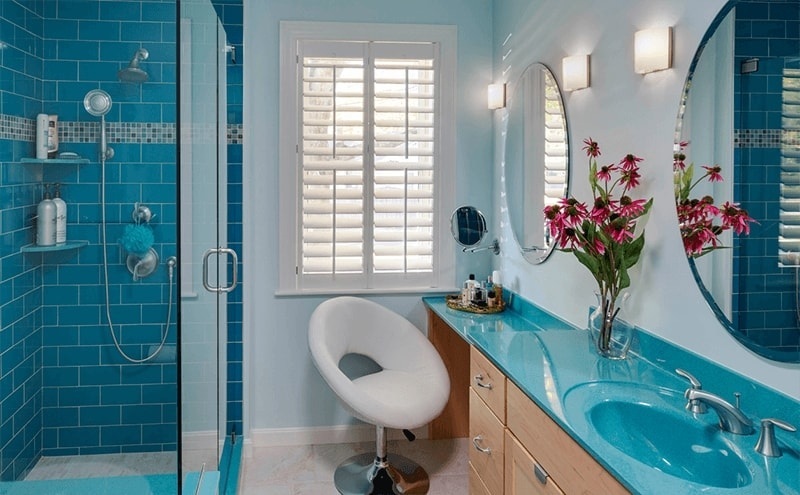 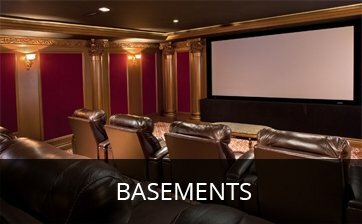 Additionally, we used low -VOC paint for the health and comfort of our clients and their family. Our client is very happy with both the form and the function of their new bath. 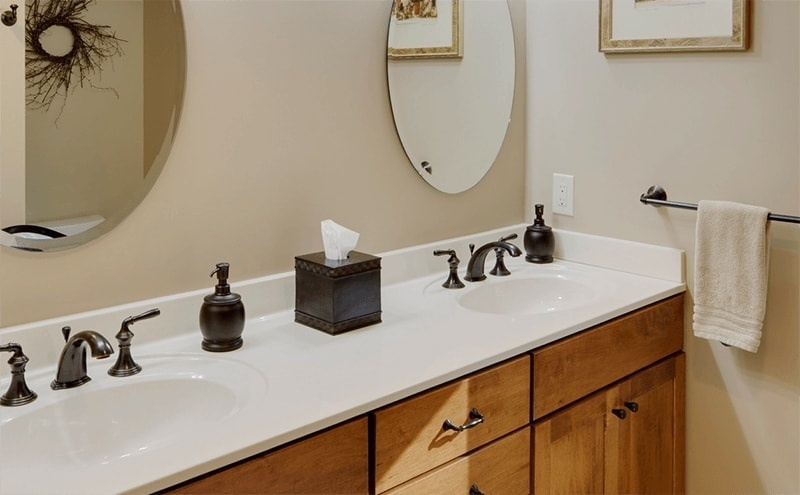 The larger vanity has helped speed up their morning routine and the increased storage space, new fixtures and flooring has facilitated keeping the bathroom clean and organized. 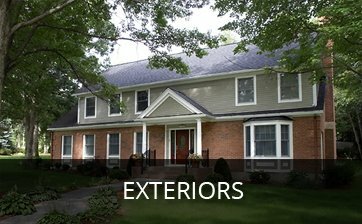 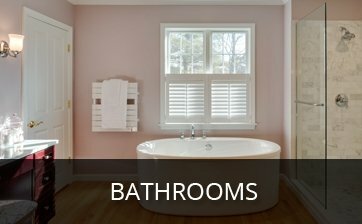 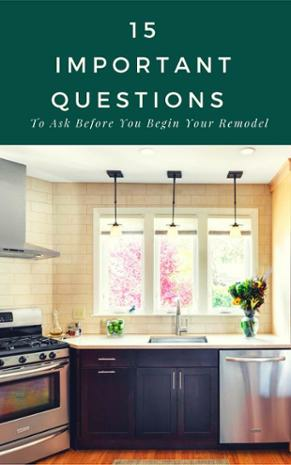 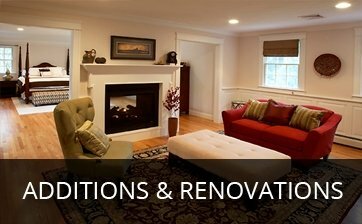 Ready to talk about your bathroom? 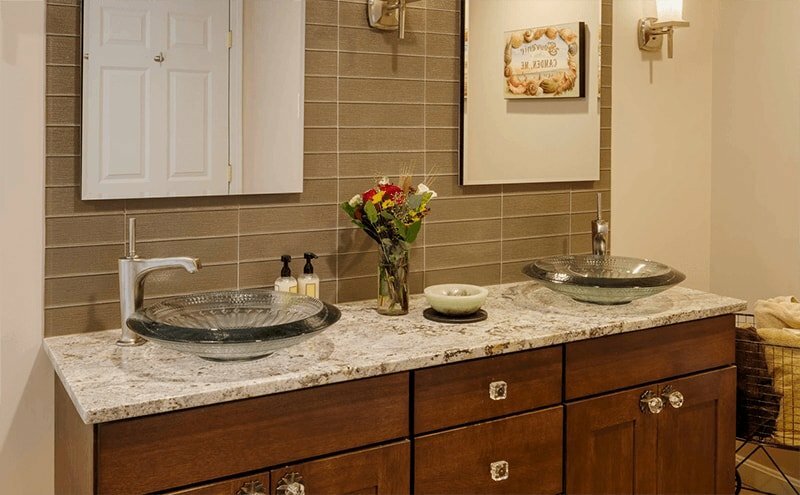 Schedule an in-home complimentary design consultation today to meet with an experienced designer to discuss your ideas for your bathroom.